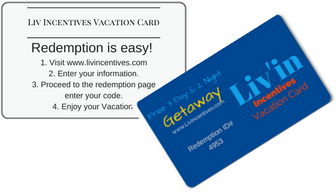 You will need to have our Redemption ID# available located on the information you received, your Getaway Card, or the Getaway Certificate to redeem you Vacation Getaway. What is the vacation certificate redeemable for? This certificate is redeemable for a reservation form, offering three days and two nights hotel accommodations for two (2) adults and two (2) children at one of the cities above. Arrival date is valid seven days a week. Arrival date must be a minimum of 30 days in advance. This offer is valid for two adults and up to two children under the age of 16. Adults must be at least 21 years of age or older with a valid driver’s license and major credit card as a matter of hotel policy. This offer does not include food, transportation, room taxes, tips, telephone calls or any item of a personal nature. A US $50 refundable deposit is required and paid for when you book your accommodations with the fulfillment travel center that will handle your reservations. The deposit is refunded to you by the fulfillment travel center after travel has been completed less a ten-dollar reservation fee. This offer is not valid for group travel or for attending a convention. No pets allowed. All reservations are subject to availability, and are limited during peak season, holidays and weekends. All destinations are subject to availability. Some destinations may be subject to seasonal surcharges. Accommodations for extra nights are available for an additional fee. You will have one year from the issue date of your reservation form to travel. How do I redeem my certificate and what happens after I redeem it? You can simply follow the directions on the website, once you fill out the information to the right, to redeem your certificate. There is a $15 processing and handling fee to redeem it. After you redeem your certificate you will receive a reservation form in the mail to book your reservations with the travel agency listed on it. Get back to the person that sent you this incentive vacation!